The horrifying execution of journalist James Foley raises an uncomfortable if familiar question: Is there anything to be gained by watching the video of his beheading at the hands of an ISIS terrorist? It’s a question that I explored 12 years ago, when Wall Street Journal reporter Daniel Pearl was similarly murdered. I searched for the video online and found it at a website whose sick operators presented such fare for the entertainment of their disturbed viewers. I shared it with my friends at The Boston Phoenix, who — to my surprise — published several small black-and-white stills of Pearl’s beheading and provided a link to the full video. “This is the single most gruesome, horrible, despicable, and horrifying thing I’ve ever seen,” the Phoenix’s outraged publisher, Stephen Mindich, wrote in an accompanying editorial. Daniel Pearl didn’t seek martyrdom, but martyrdom found him. The three-and-a-half-minute video shows us the true face of evil, an evil that manifested itself unambiguously last September 11…. We turn away from such evil at our peril. I stand by what I wrote then, but I haven’t watched the execution of Jim Foley. In contrast to the Daniel Pearl footage, the Foley video is bright and clear, in high definition. I’ve watched a bit of it, listened to him speak while kneeling in the desert; but that was all I could handle. I don’t disagree. But it should be a matter of choice. Gawker, among the first media outlets to post a link to the video, made sure its readers knew that what they would see if they clicked was “extremely disturbing.” By contrast, the New York Post and the Daily News published front-page images of Foley (I’ve linked to a Washington Post story, not the actual images) just before his beheading — in the New York Post’s case, barely a nanosecond before. It’s a fine line, but I’d say Gawker was on the right side of it, and the New York tabloids were not. For those of us who knew Jim, the road ahead will be particularly long and trying. As a lifelong journalist, the path forward for me will be rooted in a renewed and profound respect for a profession that for Jim was not a job, but a calling. And here is an interview with GlobalPost co-founder Charles Sennott, talking about Foley on WGBH Radio (89.7 FM). We’ve learned a lot since the execution of Daniel Pearl. One of the things we’ve learned is that bearing witness does not necessarily lead to a good result. Years of war in Iraq and Afghanistan have not created a safer world. 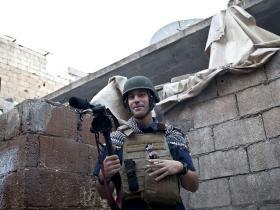 Do we have a right to view the James Foley video? Of course. Twitter, a private company that has become a virtual public utility, is heading down a dangerous road by banning images from the video. Should we watch the video as a way of witnessing unspeakable evil, as Jeff Jacoby argues? That, I would suggest, should be up to each of us. Above all, we should honor the bravery and sacrifice of journalists like Daniel Pearl and James Foley, who take risks most of us can scarcely imagine. Let’s keep the Foley family in our thoughts, and celebrate the safe return of Peter Theo Curtis. And let’s send offer whatever good thoughts we can for Steven Sotloff, a fellow hostage of Foley’s who was threatened with death last week. I am tired of Media Bias and Prejudice from both sides. I just want fair and balanced news reporting. The commentaries and opinions are truly nauseating. I can’t stand Fox or Bill O’Reilly and Company, Hannity, Megyn Kelly along with Juan Williams are nothing more than attention magnets, it’s all about them. WBUR, WGBH, Diane Rehm are just as boring, the minute you turn on their programs, you know what you’re going to hear. So why bother ? Like TV, Radio is becoming more of the same, so I turn to my computer, the last frontier. Dan: Amen to your comment about the videos. I have watched neither, and will not. It strikes me as a grotesque invasion of privacy and decency. Anne: I do not agree with you about Diane Rehm. While her politics are discernible from her interviews, she conducts civilized discussions with people representing all points of view. I would contrast her style with the obstreperous approach of Tom Ashbrook, who injects himself into every conversation and interrupts constantly. I can’t listen to Diane Rehm. I feel guilty, because it’s not her fault. If you could only get past her voice, which is a sad story in itself, you would see how civilized, incisive, and comprehensive her interviews are. On the other hand, if I understand WGBH’s plans, they may no longer carry her when they expand BPR to three hours sometime in September.